The contrast top and stitching gives this budget-conscious large duffel athletic flair. Thank you for the wonderful selection you have on your web site. 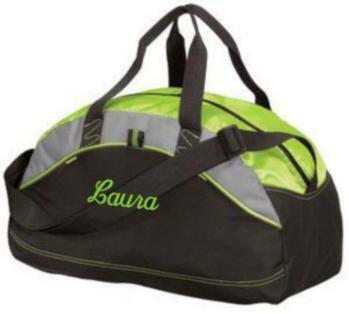 I was surfing the Internet looking for duffel bags that I could have personalized for my two grandchildren. Fortunately your site came up and I was thrilled to see exactly what I was looking for! You did a beautiful job with the monograms and shipped them unbelievably fast! I'm looking forward to Christmas morning and their expressions when they open their gifts. THANK YOU SO MUCH! I will highly recommend your web site to my family & friends.